What makes a workplace great? Your knee-jerk response might focus on salary and benefits, but we all know it’s more than that. Do you feel challenged? Are you encouraged to grow? Do you have a say in your company’s direction? Do you feel like it’s your company? Do you like your co-workers? We’ve had the goal of being a great place to work for a long time, but that can mean different things to different people. We realized that in order to actually make it happen and in turn become a stronger, more impactful business, we had to figure out what a “great place to work” meant to us. We know that becoming a great place to work is like scaling a never-ending mountain, always striving to get closer to the peak and recognizing there’s continued room for growth. We’re working on building a shared understanding of how we can work together and what’s important to us as an organization, and that’s helping us move up that mountainside. We are an Internet and catalog company, and we understand that by producing a catalog we use the earth's resources. We try our best to minimize that impact by shifting more business online, limiting how many catalogs we mail, and printing our catalogs on either recycled paper (virtually all of which is from 30% post-consumer waste) or paper sourced from FSC certified forests (which are harvested in a sustainable manner). Giving back is important to us and we want to share this passion with our customers. That's why we created the Better to Give Program in 2001, which allows you to select a non-profit organization to receive a $1 donation from us at checkout. Learn more here. 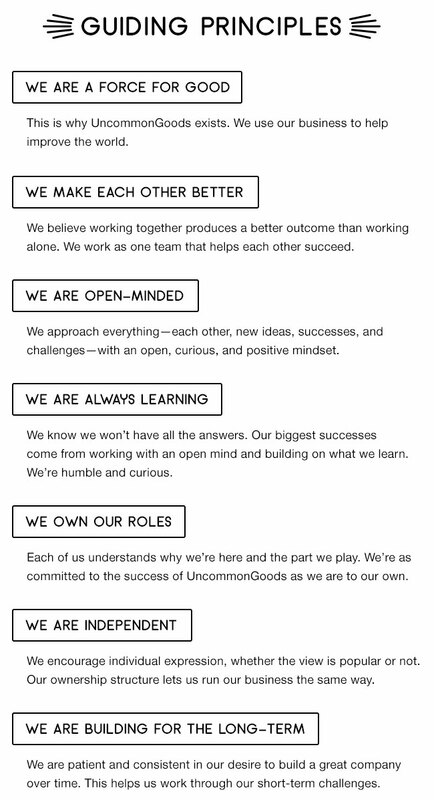 UncommonGoods is proud to be a founding member of B Corporation, an organization created to help customers understand the social and environmental impact of their purchases. The B seal means that a company has met the standards outlined in a comprehensive screening questionnaire, which evaluates a company on issues ranging from providing a living wage to lessening their impact on the environment, to giving back to the community. As the founder of UncommonGoods, I am committed to our sustainability effort and would welcome you to send any ideas you have to sustain@uncommongoods.com.